The Sensex closed 536.58 points, or 1.46%, lower at 36,305.02, while the Nifty 50 fell 168.20 points, or 1.51%, to close at 10,974.90. The BSE MidCap and SmallCap indices declined 2.40% and 2.70%, respectively.Sixteen out of 19 BSE sectoral indices ended lower with realty losing most at 5.10%. Auto, finance and consumer discretionary goods and services fell over 3%. IT, technology and energy were up 2.06%, 1.37% and 0.44%, respectively.TCS, Coal India, Infosys, Reliance and NTPC were among the top gainers, whereas HDFC, Mahindra, Indibulls Hosuing Finance and IndusInd Bank were among the major losers.Meanwhile, FIIs bought shares worth a net of Rs 760.70 crore on Friday, while DIIs purchased equities worth Rs 497.03 crore, provisional data showed. Graphite India Ltd denied reports that it had lied to stock exchanges regarding consent for operation for its Bangalore plant. Shares traded 4.94% down at Rs 902. Bharat Heavy Electricals Ltd said that it has entered into a technology collaboration agreement with Babcock Power Environmental Inc. USA to offer air pollution control products. BHEL shares traded at Rs 70.70 per share, down 1.12%. Lakshmi Vilas Bank Ltd has disclosed that it has an exposure to an IL&FS subsidiary. The bank said it had received multiple queries from investors regarding its exposure to the ILFS group. The bank, however, said it could not share further customer specific data due to business constraints. The bank’s shares fell as much as 2.43% to Rs 86.15, but soon recovered and traded 0.85% up at Rs 89.05. Sebi on Friday relaxed the know-your-client (KYC) norms and eligibility conditions for foreign portfolio investors. Mint looks at Sebi’s major decisions on FPIs and how these will impact them. Shares of the IT companies traded higher after the Reserve Bank has shortlisted five IT firms— Capgemini Technology Services India, IBM India, Infosys, Larsen & Toubro Infotech and Tata Consultancy Services—for implementation of a centralised information and management system (CIMS) for seamless data collection and validations. The Nifty IT Index was up over 2% led by Infibeam, TCS, Tech Mahindra and Infosys. BSE Sensex traded lower by 452.56 points, or 1.23%, to 36,389.04, while the Nifty 50 fell 91.25 points, or 0.81%, to 11,143.10. 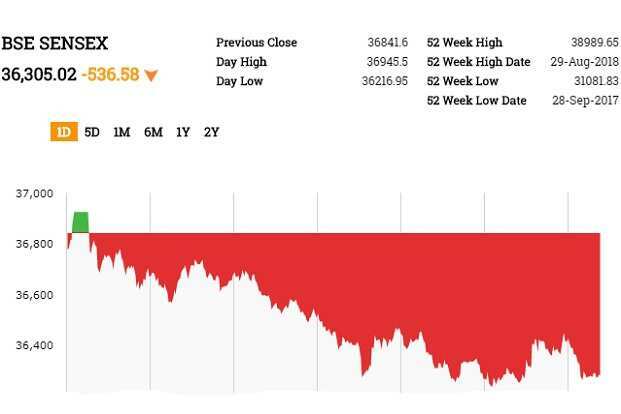 BSE MidCap and SmallCap were down 2.19% and 2.54%, respectively.In intraday trade, the Sensex slumped as much as 602 points to a low of 36,239.57 and the Nifty 50 plunged 197.05 points to 10,946.05.All the sectoral indices on BSE, except IT and teck, declined with realty losing most at 4.85% followed by auto 3.69%, consumer discretionary and goods services 3.15%, finance 2.95% and industrials 2.27%. Generic Engineering Construction and Projects Ltd shares rose as much as 4.88% to Rs 194.40 per share after the company said it has received multiple orders to the tune of Rs 273.92 crore from real estate developers and one from India’s leading defence public sector undertaking. DHFL in a statement today reiterated that the company has neither defaulted on any bonds or repayment of its financial obligations, nor has there been any instance of delay on any repayment of any liability. It further added that DHFL fulfilled on September 21 its commitment of repaying commercial papers worth Rs 575 crore and as per schedule and terms, is repaying Rs 400 crore on September 24. DHFL shares 11.09% up at Rs 390.55. The Sensex opened at 36,924.72, up 83 points from its previous close and hit a high of 36,945.50. But soon erased all the gains and fell as much as 283 points to a low of 36,558.61. On NSE, the Nifty 50 opened 21.3 points up at 11,164.40 and hit a peak of 11,170.15. But it failed to hold gains and dropped as much as 102.45 points to a low of 11,040.65.BSE Sensex traded lower by 188.60 points, or 0.51%, to 36,653, while the Nifty 50 fell 67 points, or 0.60%, to 11,076.10. BSE MidCap and SmallCap fell 1.30% and 1.63%, respectively. Among the sectoral indices on BSE, IT and oil and gas, teck and energy gained, while realty, auto telecom and finance led losses.The Sensex basket had 11 advances and 20 declines. 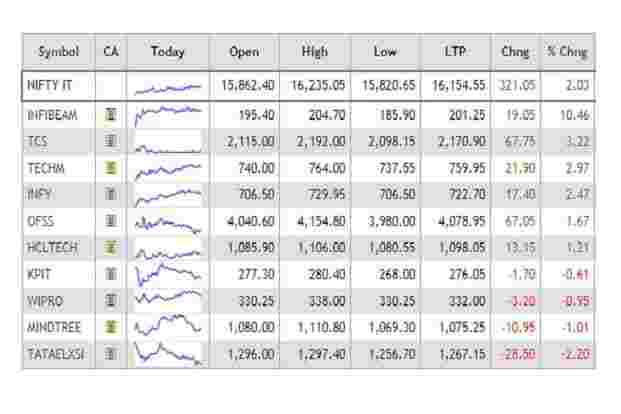 On NSE, the Nifty has 21 advances and 28 declines. Vedanta, Coal India, Infosys, ONGC and TCS were among the top gainers, whereras HDFC, Maruti, Mahindra, Indiabulls Housing Finance and IndusInd Bank were among the major losers. Shares of IL&FS Transportation Networks and IL&FS Investment Managers rose as much as 19.9% and 7.2%, respectively, as parent Infrastructure Leasing and Financial Services (IL&FS) is planning to boost its authorized share capital by Rs 4,000-5,000 crore to enable the cash-strapped group to raise money from its shareholders, reported Mint, citing two people with direct knowledge of IL&FS Group’s plans. Yes Bank shares traded 0.46% down at Rs 226. In early trade, the stock fell as much as 4.86% to Rs 216. RBI had asked Yes Bank last week to end Rana Kapoor’s tenure as managing director and chief executive on 31 January, disregarding the bank’s plea to extend his term by three years. Shares of Usha Martin Ltd traded 3.18% up at Rs 32.40. In early trade, the stock rose as much as 15.9% to Rs 36.40 after Tata Steel on Saturday announced it will acquire the steel business of Usha Martin Ltd for Rs 4,300-4,700 crore. The sale of steel business to Tata Steel will help the company in “significant reduction” of its debt, Usha Martin said in a filing to the BSE. The deal is expected to be completed in 6-9 months, it added. Tata Steel shares were down 1.09% to Rs 617.75. Biocon shares rose as much as 2.94% to Rs 696 after the company and its partner Mylan announced that they have received positive opinion from the European Medicines Agency’s Committee for Medicinal Products for Human Use for recommending approval of bio-similar product ‘Fulphila’. This positive opinion will now be considered by the European Commission. The decision on approval is expected by Nov. 2018. The USFDA also completed their inspection at Biocon’s Bangalore facility with no Form 483 being issued. Shares of Dewan Housing Finance Corp Ltd surged as much as 24.80% to Rs 438.75 after the company said it has enough funds for repayments. On Friday, DHFL shares closed at Rs 351.55 per share on the BSE, down 42.43%, or ₹ 259.05, from the previous session. The DHFL stock slumped nearly 60% in in intraday trade on Friday following media reports that DHFL had defaulted interest payment on its debt. However, DHFL chairman and managing director Kapil Wadhwan quickly denied and added that the company has ample liquidity of Rs 10,000 crore. The Indian rupee weakened against the US dollar, tracking panic selling in the local equity markets. At 9.07am, the rupee was trading at 72.45 to a dollar, down 0.34% from its Friday’s close of 72.20. The home currency opened at 72.47 per dollar. The 10-year gilt yield stood at 8.031%, below its previous close of 8.07%. Bond yields and prices move in opposite directions. So far this year rupee has declined 11.5%, while foreign investors have sold $1.22 billion and $6.79 billion in the equity and debt markets, respectively. Shares of finance companies fell anywhere between 10-50% on Friday. Oil climbed near the highest level in more than two months after OPEC and its allies signalled less urgency to boost output and stopped short of promising extra volumes of crude despite US pressure to temper prices. Brent crude futures gained 92 cents to $79.72 a barrel, while U.S. crude futures rose 77 cents to $71.55.Gold edged lower as the dollar held firm on news that China has cancelled trade talks with the United States, with the market also eyeing this week’s US Federal Reserve meeting for guidance on future rate hikes. Spot gold inched down 0.2% to $1,196.51, after falling as much as 1.3% on Friday on a stronger dollar. US gold futures were virtually unchanged at $1,201.1 an ounce.